Astonishingly enough, the nice, nine-hole golf course on the right bank of the Vltava was once a site of devastated land filled with illegal dumps, strange sheds, and unsightly fences. 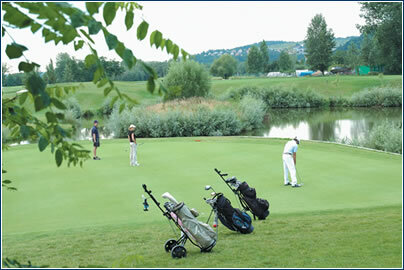 UNTIL THIS AUGUST there was only one nine-hole golf course – in Prague-Motol – within the Czech capital. Then the city-owned land between the Modřany weir and the railroad bridge was converted into a very nicely situated course with the largest diving range in the republic. To the casual observer its virtue is that it looks like it’s always been here. It fits perfectly into the landscape, bordered on one side by the Vltava and on the other by a tram embankment. Architect Jiří Velden, a resident of Hodkovičky who has penned many golf projects, designed the course for this space. The construction of the now-admired project was made possible by the accomodating attitude of City Hall, led by then-lord mayor Koukal and Povodí Vltava (Vltava Basin). 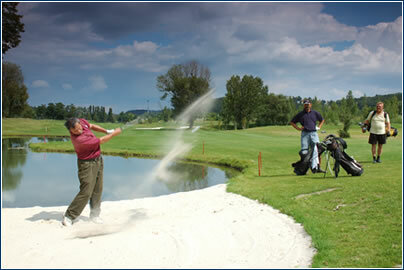 Not much was built between 1996, when the Golf & Country Club Hodkovičky was founded, and 2001. Shortly after major construction began, just when the new course was beginning to take shape, the great floods of 2002 came. The water not only washed away the clubhouse, it also damaged the already reclaimed part of the area. On the other hand, it also washed away nearly all of the bizarre structures and an unattractive concrete factory. Earth movers then helped complete the landscaping, including artificial water bodies and a natural anti-flood mound. But what’s important is that Prague residents and visitors now have a recreational area that covers 34 hectares at their disposal, complete with bicycle trails and paths for in-line skaters. At a time when a golf boom is inundating the Czech Republic, there is a well maintained course that is easily accessible right in Prague. The par 36 course has nine holes and a total length of 5,498 meters, as well as 50 tees on the driving range, five practice greens intended for putting practice and approaches form sand traps, and an expansive parking lot. Next spring a new, classy clubhouse now under construction should be open. For three years, the shop Golf Discount (and its website) has offered an impressive assortment of world- famous brands for reasonable prices. It is a direct importer and exclusive representative and distributor of the British golf brand Regal Golf, as well as an authorized sales point of Mizuno Golf brand. 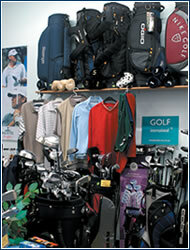 There are also items from many other top American and European manufacturers of golf equipment. The shop distributes to many contractual partners around the country, so you can try out most of the golf clubs on a driving range at courses such as Mstětice, Líšnice, Brno, etc.